On April 25, 2015, an earthquake with a magnitude of over 7.8M killed more than 9,000 people and injured more than 23,000 in Nepal. This is the second story in a series which highlights preparedness measures taken by every day individuals before the earthquake struck. “When the earthquake struck, I was with my small daughter (5 Month) in the top floor. My 6 years old son was downstairs. He started to cry but didn’t came up and asked “which one is the inner wall (safe place)?” and I said that the place where you are is the inner wall and he stayed there. I also stayed in the inner wall with my small daughter until the shaking stopped. As soon as the shaking stopped, I took my son and daughter out of the house along with our “Go Bag” (Emergency Kit named as Go Bag). We went out in courtyard, the nearby open space. Since I had received training on earthquake preparedness and emergency response organized by NSET a couple of years ago, I told my children and other family member not to panic or use the staircase but stay at the safe place and go outside once the shaking stops. This worked for us. I had also learned about the need to store the emergency items in a kit from the training. I knew that the Go Bag was important and so kept one myself but I had not imagined that our GO-Bag could be so much useful under such chaotic circumstances. 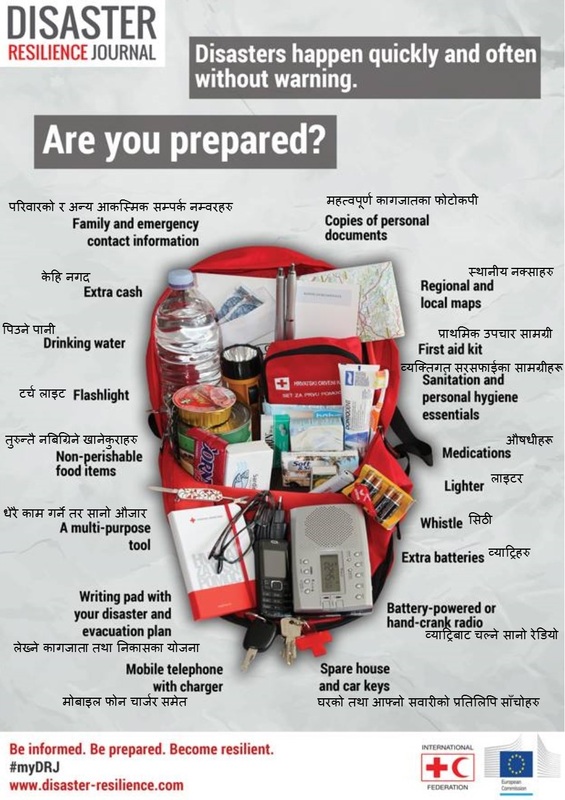 All the items of my Go Bag like Dettol, “Piyush” (water purifier), tarpaulin, head lamp, toothpaste, and soap, etc. came to use. We used the tarpaulin for emergency shelter and stayed there. Dettol was used in cleaning the wounds of the children. Due to earthquake many people had headache and indigestion so I gave them the Cetamol and Digene from the Go Bag. We all were using the soap and toothpaste from the Bag. I had also kept Playing Cards in the Bag. The young boys who stayed awake during the nights, played cards to keep awake and keep the area safe as well. Sita Shrestha from Thankot, Chadragiri Municipality got training on Disaster Risk Management from NSET in 2012 under Nepal Earthquake Risk Management Project (NERMP II). Thankot, Chandragiri Municipality is one the municipalities where NSET is implementing its Community Based Disaster Risk Management Program.